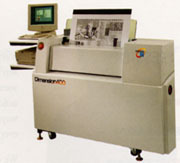 We believe the Dimension 200 is the best 2-up platesetting system available. Files are imaged directly from computer to Presstek Anthem metal plates (not delicate, troublesome polyester plates, but real thermally-imaged aluminum plates). What's special about these plates imaged on the Dimension 200? NO film, NO chemical processing, NO darkroom, NO plate-burning, NO dot gain! Environmentally friendly with stunning image quality and performance on press. We print 150lpi/2540dpi and above with these plates, with a screen/halftone density range of 1% to 99%. For single color to 4 color work, this system makes the best printing plates we have ever seen, even better than traditional lithographic plates. And plates can be made within minutes, instead of hours, so we get that rush job done faster, and recover from prepress and on-press errors quickly.